A good basic introduction to Anonymous and hacktivism generally, through the lens of OpSafeWinter. They are nameless, faceless, they can be everywhere, they can be anyone. Anonymous are nurses, fire fighters, taxi drivers, bin men, road sweepers, doctors. Maybe Anonymous is the woman next door, your hairdresser, or the guy sat in front of you in the bus. They are more than 2 million people strong. They are legion. 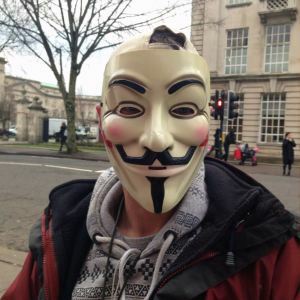 His alias is Jay Dontcare, he is one of the members of the Welsh Anonymous group. His name must remain out of the public domain for obvious reasons.